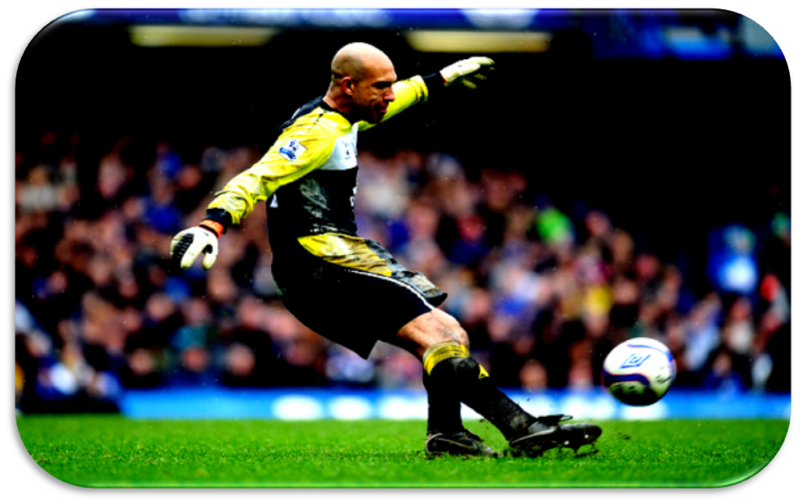 Scout Report: Tim Howard – Best of the rest? When you’ve had the pleasure of watching one of the greatest players of all time in his position play for your club, it’s difficult to judge his successors fairly. Only Nigel Martyn has been universally accepted by the Goodison faithful as a great keeper since Neville Southall left Everton in 1998. Tim Howard easily comes next as best of the rest but he’s never totally convinced all fans that he’s as good as we can get. Is this fair? What can the stats from last year tell us about Everton’s No 1? We may not like to think so, but it’s a fact that Everton play more long balls than most sides in the Premier League. However, it’s also a fact that Howard contributed less long balls to his side than any other keeper last season. The average for a keeper was around 40% and the keeper who did it most was Petr Cech who launched 59% of all of Chelsea’s long balls. Howard played just 28% of Everton’s. Twice already this season Howard has conceded from close-range headers at corner kicks. While the one against WBA was poor, the one against Southampton was downright shocking. Although both times the attacker was allowed free reign by defenders, Howard didn’t take control of either situation considering how far into his radar the ball came . However, Howard is proactive compared to most of his peers. He dealt with 11% of all high crosses Everton faced last year by claiming or punching. There were 14 other No 1’s below him in this regard. The numbers also tell us that the odd mistake or flap comes with the territory if you’re a keeper who comes out – the likes of Cech and Wojciech Szczesny do it too. Most of the time it doesn’t cost a side, it’s just that when it does, it looks extremely bad. The keepers who chose to stay on their line fared badly last season or are looking at being replaced this season –Paul Robinson, Ali Al-Habsi, Paddy Kenny and Shay Given and Brad Friedel. There are a couple of other interesting stats that might tell us more about Howard’s command of his area and of the defenders around him. The first is that he picks up a great deal of loose balls compared to most keepers. This again suggests he’s quick to come out but could mean Everton’s high line and pressing game leads to a fair amount of aimless long balls from the opposition sailing straight through to him. The second is that Howard faced less one-on-ones than any other keeper in the league. All this points to Everton’s defensive organisation being good and Howard obviously plays his role in that. When Everton have conceded in recent times, there’s often an abhorrent individual mistake involved but in general the numbers say Everton’s defence is well organised and Howard must take part of the credit for this. This is often the greatest criticism you hear about Howard. He often looks leaden-footed or on his heels when shots come in from distance. Comparing the number of goals conceded from shots outside the box to the number of saves made from them, Howard, again more than held his own in the division. There were 13 keepers below him in this regard last season. Howard let in 14% of all shots from outside the box that needed dealing with. There were 9 keepers letting in 20% and more – the worst being Paul Robinson who let in a shocking 35%. While the kind of stats above can give us some clues as to a keeper’s style and performance, the hard currency they deal in is stopping goals. Only David De Gea and Pepe Reina let in less goals per game last year than Tim Howard. All keepers make mistakes, and all have their faults. Tim Howard may not be a “Top 4” keeper overall, but, much like his team, he’s always fighting to be best of the rest. This entry was tagged @footballfactman. Bookmark the permalink. Having watched him ever since he came to everton I would say he is EXTREMELY fortunate to have had such great defenders in front of him for so long. His kicking is absolutely woeful, he can’t judge crosses, even if he “deals” with a cross more often than not he flaps at them and they just end up lose inane around the area. Anything which is marginally in the air hit from on the edge of or just outside the area he has no chance with, he is the only goalkeeper I have ever seen who actually makes himself smaller when he dives. All in all a very average keeper AT BEST and the first player I would replace if I were manager.